In my opinion, it’s never too early to start adding some holiday cheer to your calendar. The magic of the Holiday Season lives from the day after Thanksgiving and seems to carry through the new year, and the charm and enchantment of Madison and Morgan County during this time is why so many people travel here to celebrate Christmas. From tree lightings to parades and gingerbread house-making parties to holiday gift markets, Madison has something for everyone to enjoy. Read on for what events make Madison no place like any other for the Holidays! 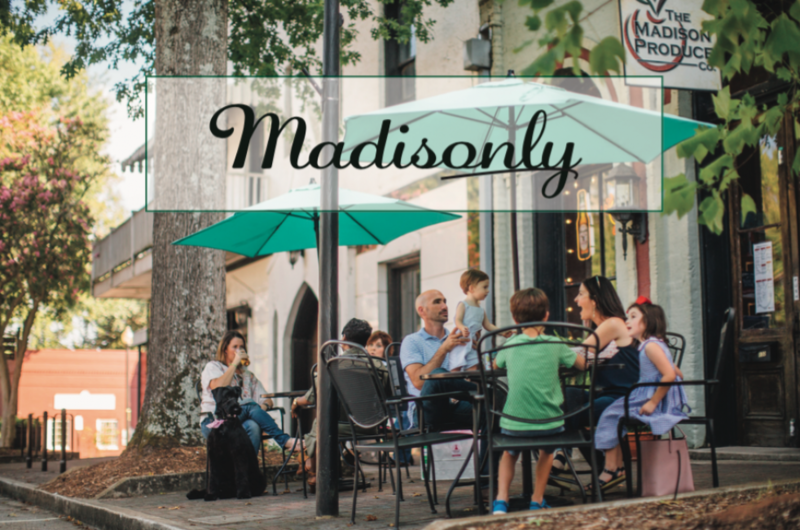 Shop, Sip & Stroll in Downtown Madison to kick off the 2018 Holiday Season! The downtown businesses will have special promotions and events so shopping locally for unique, handmade gifts has never been better. As you stroll between our great merchants and restaurants, enjoy holiday characters, live holiday music, and carolers! Here’s another opportunity to shop for locally handmade gifts for your loved ones and show your support for the small independent businesses that make up our great Downtown. Plus, when you spend $24 with one of our merchants – stores, salons, spas, and restaurants are all included – your name will be entered into a drawing to win one of two $100 Downtown Dollar gift certificates! Santa Claus is coming to Mint Juleps Kitchen! Santa will be reading his favorite Christmas poem to get us all in the Christmas spirit. Enjoy some homemade cookies and don’t forget a picture with Santa; this is the perfect opportunity to get those Christmas card photos crossed off your list! Step into a winter wonderland as you celebrate the season with a holiday favorite, the Holiday Tour of Homes in Madison, GA! With both daytime and candlelight itineraries, this magical event is not to be missed. This is a walking tour of historic and private homes fully decorated for the holidays. Just next door to Madison sits Small but Special Rutledge, GA, and their Christmas Festival is not to be missed! There’s always lots of good food, crafts, activities for the kids, and a great parade at 10:00 AM! The best part: It’s during the day before Madison’s celebrations (see below) so you can come to Morgan County and make a day out of it! Celebrate the holiday season in small town style; come to Madison for the Holiday Parade and Caroling by Candlelight! The Holiday Parade will feature floats, walking groups, vintage cars, horses, dogs, dancers, and the award winning MCHS Marching Bulldog Band, all decorated to this year’s theme, ‘Deck the Halls.’ After the parade, join us for an evening full of music and holiday spirit. Local choral groups, bands, and community based musicians will perform holiday carols certain to warm our hearts. Santa Claus, Mrs. Claus and the Elves will be on hand to hear Christmas wishes. Warm your hands with a steaming cup of hot chocolate, and tasty marshmallows roasted over an open flame, and decorate gingerbread men with our friends from the Madison Aritsts Guild. An annual favorite for over 40 years! The Grammy Award-winning Atlanta Symphony Orchestra performs a program of holiday and classical favorites at the Madison-Morgan Cultural Center, including a sing-a-long of familiar holiday tunes. Do you have a tradition for how you get into the Holiday spirit? Adding some of these events to your family’s memories makes the season even more magical! Next Post It’s Time for the Holiday Tour of Homes!